On this Audite release Strasbourg born cellist Marc Coppey turns his attention to works by Dvořák and Bloch. The feature work is Dvořák’s Cello Concerto, surely the greatest ever written; it is accompanied by the Czech composer’s much shorter work Klid. From some twenty years later, the other major score included is Bloch’s Schelomo a worthy work that like many others tends to get pushed aside in favour of Dvořák’s masterwork. By the early 1890s Dvořák’s fame had travelled far and wide from his Czech homeland. A princely fee drew him across the Atlantic to accept an offer of employment from Jeanette Thurber founder of the National Conservatory in New York City. From 1892 to 1895 he held the position of conservatory director. Dvořák’s stay in the United States was not only lucrative but also highly productive. The Cello Concerto was amongst the works written on the trip. Completed in 1895 it is dedicated to Dvořák’s friend Hanus Wihan, the founder and cellist of the Czech String Quartet. Balancing control with very well-judged weight of expression, Coppey delivers an engaging performance producing a lovely sound from his cello by Matteo Goffriller ‘Van Wilgenburg’ (1711). Coppey’s playing of the opening Allegro is marked by clear and vibrant tone. Notable too is the attractive horn solo heard early in the movement. In the Adagio Coppey communicates a yearning and introspective quality that develops into an aching melancholy. It is no coincidence that the finest players avoid the temptation to go in for self-indulgence here. In the Finale there is a sense of elation to Coppey’s appealing and successful playing. Although clearly attuned to Dvořák’s Bohemian sensibility Coppey cannot match the grandeur that performers such as Rostropovich, Pierre Fournier and Du Pré bring, but then again few can. Coppey commits an enthralling recording of the Dvořák concerto to disc but like most others doesn’t come close to deposing Rostropovich’s life-enhancing account with Berliner Philharmoniker under Herbert von Karajan on Deutsche Grammophon. Produced in 1969 at Jesus-Christus-Kirche, Berlin it shows Rostropovich in his prime, rich in spontaneity, stunning virtuosity and passion. That award-winning recording certainly deserves its landmark status. More strong competition comes in intensely moving form from Jacqueline du Pré in 1967 at Stockholm with the Swedish RSO under Sergiu Celibidache on Teldec. Notable, too, for nobility and lyricism is Pierre Fournier with the Berliner Philharmoniker under George Szell from 1961 at Jesus-Christus-Kirche, Berlin on Deutsche Grammophon. Rather under the radar is another account which I greatly enjoy played by David Finckel with the Taipei Symphony Orchestra under Felix Chiu-Sen Chen. Finckel was recorded in 2003 at Chungshan Hall, Taipei and has been re-mastered and reissued in 2015 on ArtistLed. For his ‘farewell tour’ in 1891, prior to leaving his adored Czechoslovakia for the post of director of New York Conservatory, Dvořák included in the programme his score Klid (Silent Woods) published under the German title Waldesruhe, Op. 68/5. Klid was originally the fifth of the composer’s set of piano duets From the Bohemian Forest. A melodic character piece, Klid is played here by Coppey with a strong sense of concentrated nostalgia and reflection, with an eminently comforting feel. Of the alternative recordings of Klid I greatly admire the captivating 2009 Copenhagen account from Sol Gabetta with Danish National Symphony Orchestra/Mario Venzago on RCA Red Seal. Bloch’s Schelomo - Hebraic Rhapsody for cello and orchestra was inspired by text from the Biblical book of Ecclesiastes. Written in 1915/16 this is one of the last works Bloch wrote in Europe before touring the USA. Hans Kindler, who was at the time principal cellist of the Philadelphia Orchestra, gave the première of the score in 1917 at Carnegie Hall. In this disarmingly passionate work Coppey proves adroitly attuned to the intense emotions that run through the score from tortured anger and rapt expectation to brooding despair and yearning. Of the competing accounts of Schelomo, the intensely expressive recording from 1961 by soloist Leonard Rose with the Philadelphia Orchestra under Eugene Ormandy on Sony (Columbia) is hard to ignore. Throughout each work on this Audite album Kirill Karabits conducts the outstanding Deutsche Symphonie-Orchester Berlin in a performance which has real cohesion and internal balance. Recorded at the RBB Studios, Berlin there are no problems at all with the sound quality which is comparatively warm and atmospheric but with respectable clarity and balance. In the booklet there is a short note from soloist Marc Coppey and an informative essay ‘The Cello Concerto and its Satellites’ from Habakuk Traber. There is enough space on the album to have included say Bloch’s triptych From Jewish Life or Dvořák’s Rondo in G minor. 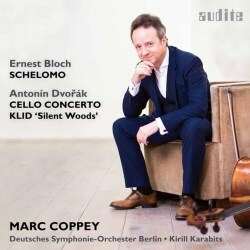 On fine form, Marc Coppey aptly demonstrates his prowess with these Bloch and Dvořák scores but the competition is extremely fierce especially in the Cello Concerto, a masterwork of the repertoire.